1. Keim P, Price LB, Klevytska AM, et al. Multiple-locus variable-number tandem repeat analysis reveals genetic relationships within Bacillus anthracis. J Bacteriol 2000;182(10):2928-2936. 2. Klevytska AM, Price LB, Schupp JM, et al. Identification and characterization of variable-number tandem repeats in the Yersinia pestis genome. J Clin Microbiol 2001;39(9):3179-3185. 3. Read TD, Salzberg SL, Pop M, et al. Comparative genome sequencing for discovery of novel polymorphisms in Bacillus anthracis. Science 2002;296(5575):2028-2033. 3a. Pop M, Phillippy A, Delcher AL, Salzberg SL. Comparative genome assembly. Briefings in Bioinformaties 2004;5(3):237-248. 4. Lander ES, Waterman MS. Genomic mapping by fingerprinting random clones: A mathematical analysis. Genomics 1988;2:231-239. 5. Ewing B, Hillier L, Wendl MC, Green P. Base-calling of automated sequencer traces using phred. I. Accuracy assessment. Genome Res 1998;8(3):175-185. 6. Altshuler D, Pollara VJ, Cowles CR, et al. An SNP map of the human genome generated by reduced representation shotgun sequencing. Nature 2000;407(6803):513-516. 7. Gajer P, Schatz M, Salzberg SL. Automated correction of genome sequence errors. Nucleic Acids Res 2004;32(2):562-569. 8. Fraser CM, Eisen JA, Nelson KE, et al. The value of complete microbial genome sequencing (you get what you pay for). J Bacteriol 2002;184(23):6403-6405; discussion 6405. 9. Fleischmann RD, Adams MD, White O, et al. Whole-genome random sequencing and assembly of Haemophilus influenzae Rd. Science 1995;269(5223):496-512. 10. Sutton G, White O, Adams M, Kerlavage AR. TIGR Assembler: A new tool for assembling large shotgun sequencing projects. Genome Science and Technology 1995;1:9-19. 11. Myers EW, Sutton GG, Delcher AL, et al. A whole-genome assembly of Drosophila. Science 2000;287(5461):2196-2204. 12. Venter JC, Adams MD, Myers EW, et al. The sequence of the human genome. Science 2001;291(5507):1304-1351. 13. Salzberg SL, Delcher AL, Kasif S, White O. Microbial gene identification using interpolated Markov models. Nucleic Acids Res 1998;26(2):544-548. 14. Delcher AL, Kasif S, Fleischmann RD, et al. Alignment of whole genomes. Nucleic Acids Res 1999;27(11):2369-2376. 15. Kurtz S. Reducing the space requirement of suffix trees. Software Practice and Experience 1999;29(13):1149-1171. 16. Volfovsky N, Haas BJ, Salzberg SL. A clustering method for repeat analysis in DNA sequences. Genome Biol 2001; 2(8):RESEARCH0027. 17. Altschul SF, Gish W, Miller W, et al. Basic local alignment search tool. J Mol Biol 1990; 215:403-410. 18. Eddy SR. Profile hidden Markov models. Bioinformatics 1998;14(9):755-763. 19. Bateman A, Birney E, Durbin R, et al. The Pfam protein families database. Nucleic Acids Res 2000;28(1):263-266. 20. Haft DH, Selengut JD, White O. The TIGRFAMs database of protein families. Nucleic Acids Res 2003;31(1):371-373. 21. Eisen JA. Phylogenomics: Improving functional predictions for uncharacterized genes by evolutionary analysis. Genome Res 1998;8(3):163-167. 22. Marcotte EM, Pellegrini M, Ng HL, et al. Detecting protein function and protein-protein interactions from genome sequences. Science 1999;285:751-753. 23. Suhre K, Claveire JM. Fusion DB: a database for in-depth analysis of prokaryotic gene fusion events. Nucleic Acids Res 2004;32(database issue):D273-D276. 24. Pellegrini M, Marcotte EM, Thompson MJ, et al. Assigning protein functions by comparative genome analysis: protein phylogenetic profiles. Proc Natl Acad Sci USA 1999;96:4285-4288. 25. Claros MG, von Heijne G. TopPred II: An improved software for membrane protein structure predictions. Comput Appl Biosci 1994;10(6):685-686. 26. Nielsen H, Engelbrecht J, Brunak S, von Heijne G. Identification of prokaryotic and eukary-otic signal peptides and prediction of their cleavage sites. Protein Eng 1997;10(1):1-6. 27. Lowe TM, Eddy SR. tRNAscan-SE: A program for improved detection of transfer RNA genes in genomic sequence. Nucleic Acids Res 1997;25(5):955-964. 28. Chain P, Kurtz S, Ohlebusch E, Slezak T. An applications-focused review of comparative genomics tools: Capabilities, limitations, and future challenges. Briefings in Bioinformatics 2003;4(2):133-149. 29. Morgenstern B, Dress A, Werner T. Multiple DNA and protein sequence alignment based on segment-to-segment comparison. 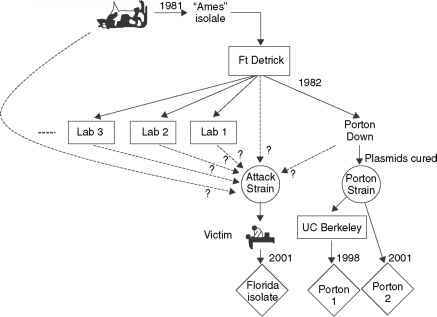 Proc Natl Acad Sci USA 1996;93:12098-12103. 30. Morgenstern B, Frech K, Dress A, Werner T. DIALIGN: Finding local similarities by multiple sequence alignment. Bioinformatics 1998;14(3):290-294. 31. Delcher AL, Phillippy A, Carlton J, Salzberg SL. Fast algorithms for large-scale genome alignment and comparison. Nucleic Acids Res 2002;30(11):2478-2483. 32. Hohl M, Kurtz S, Ohlebusch E. Efficient multiple genome alignment. Bioinformatics 2002; 18(Suppl. 1):S312-S320. 33. Abouelhoda MI, Kurtz S, Ohlebusch E. The Enhanced Suffix Array and Its Applications to Genome Analysis. Proceedings of the Second Workshop on Algorithms in Bioinformatics, Vol. 2452: Springer-Verlag, 2002. pp. 449-463. 34. Thompson JD, Higgins DG, Gibson TJ. CLUSTALW: Improving the sensitivity of progressive multiple sequence alignment through sequence weighting, position-specific gap penalties and weight matrix choice. Nucleic Acids Research 1994;22(22):4673-4680. 35. Kurtz S. A Time and space efficient algorithm for the substring matching problem. Zentrum für Bioinformatik, Universität Hamburg, 2003. 36. Zhang Z, Schwartz S, Wagner L, Miller W. A greedy algorithm for aligning DNA sequences. J Comp Bio 2000;7(1/2):203-214. 37. Kurtz S, Phillippy A, Delcher AL, et al. Versatile and open software for comparing large genomes. Genome Biol 2004;5(2):R12. 38. Carlton JM, Angiuoli SV, Suh BB, et al. Genome sequence and comparative analysis of the model rodent malaria parasite Plasmodium yoelii yoelii. Nature 2002;419(6906):512-519. 39. Smith TF, Waterman MS. Identification of common molecular subsequences. J Mol Biol 1981;147(1):195-197. 40. Pearson WR. Flexible sequence similarity searching with the FASTA3 program package. Methods Mol Biol 2000;132:185-219. 41. Altschul SF, Madden TL, Schaffer AA, et al. Gapped BLAST and PSI-BLAST: A new generation of protein database search programs. Nucleic Acids Res 1997;25(17):3389-3402. 42. 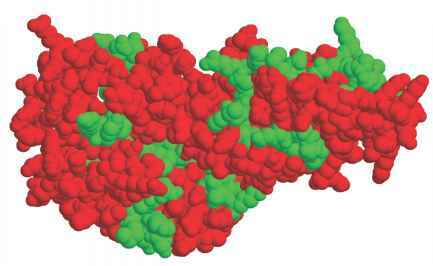 Zemla A. LGA: A Method for finding 3-D similarities in protein structures. Nucleic Acids Res 2003:31(13):3370-3374. 43. Bower MJ, Cohen FE, Dunbrack RL, Jr. 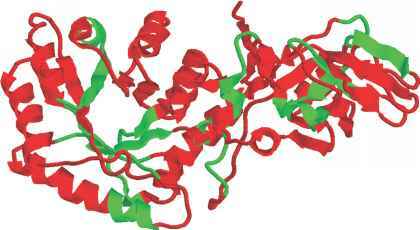 Prediction of protein side-chain rotamers from a backbone-dependent rotamer library: A new homology modeling tool. J Mol Biol 1997; 267(5):1268-1282. 44. Rost B, Sander C. Combining evolutionary information and neural networks to predict protein secondary structure. Proteins 1994;19(1):55-72. 45. Hubbard SJ, Eisenmenger F Thornton JM. 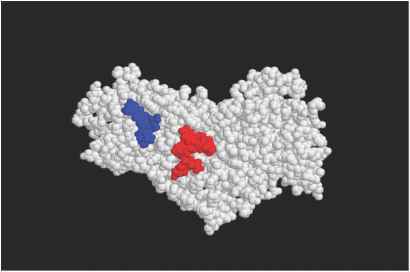 Modeling studies of the change in conformation required for cleavage of limited proteolytic sites. Protein Sci 1994;3(5):757-768. 46. Gottgens B, Gilbert JG, Barton LM, et al. Long-range comparison of human and mouse SCL loci: Localized regions of sensitivity to restriction endonucleases correspond precisely with peaks of conserved noncoding sequences. Genome Res 2001;11(1):87-97. 47. Schwartz S, Zhang Z, Frazer KA, et al. PipMaker—A web server for aligning two genomic DNA sequences. Genome Res 2000;10(4):577-586. 48. Rozen S, Skaletsky H. Primer3 on the WWW for general users and for biologist programmers. Methods Mol Biol 2000;132:365-386. FIGURE 15.1 A representation of a bi-dentate ligand that recognizes the botulinum toxin. Figure courtesy of Rod Balhorn, LLNL. FIGURE 15.2 A newly assembled contig maps to two distinct, noncontiguous locations on a reference genome. The correctness of the new contig can be determined by PCR across the juncture. FIGURE 15.3 A structure model for a pathogen protein determined by the methods described in the text. Regions in green indicate portions of the protein sequence that are both conserved and unique, based upon currently-available sequence information. FIGURE 15.7 A 3-D model of a pathogen protein, highlighting conserved and unique protein sequence peptides that are accessible on the protein surface. These indicate potential locations for protein detection signatures. This example shows how the basic structure model shown in Fig. 15.3 can be further developed.